Euclides Campos, leading a group of Canadians, found this dark-phase adult Red-footed Booby at Swan Key on January 29th. 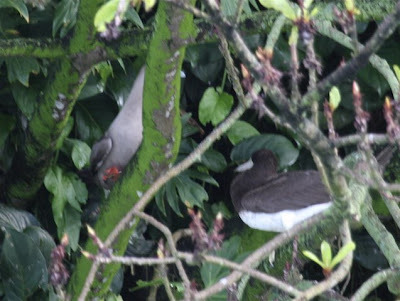 Even behind its branch, the red feet are visible, as is the blue-gray bill tip and white tail. We arrived at the island around 9 a.m. where the usual suspects were present, Brown Boobies and Red-billed Tropicbirds, but while scanning the rocky formation I spotted the bird. Photos of the Red-footed Booby are courtesy of the tour leader Rand Rudland. 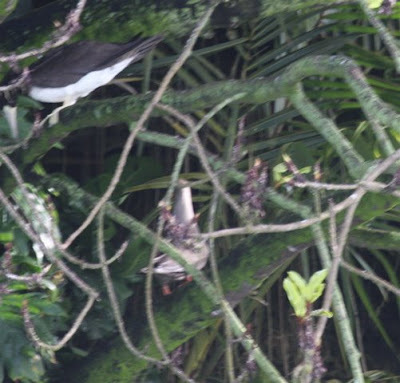 Red-footed Boobies are apparently regular off the Caribbean coast of Panama, with a few sightings from the mainland (see November 2007 report from Donoso) but this is the first report I'm aware of from Swan Key, definitely a heavily-birded site by Panama standards.